This month, digital agency We Love celebrate the evolving digital world with an infographic-inspired site, showing brands why 2013 is the year to embrace digital and go SoLoMo. 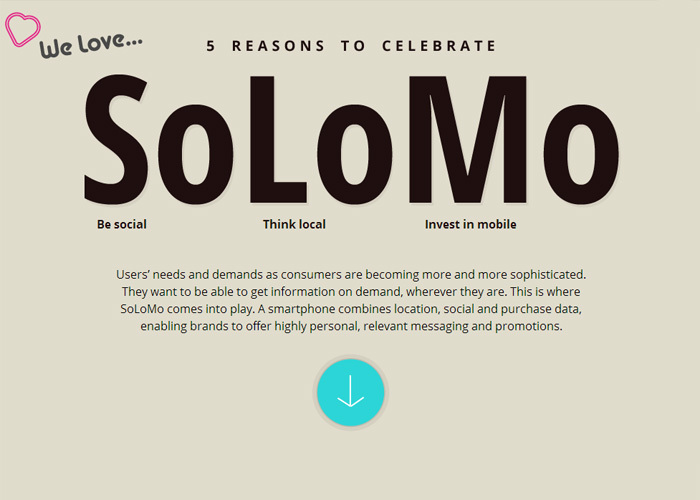 SoLoMo, developed as a result of the growing popularity of smartphones, is short for Social-Local-Mobile. It can benefit brands by not only increasing business, but also transforming user behaviour and enhancing levels of brand engagement. The SoLoMo approach blends together real-time locations with social media to give consumers the most relevant experience for where they are and what they are trying to achieve at a specific time.